4 years of an undergraduate degree followed by 2 years getting a Master’s degree, all you really think about is that first payday when you start your Clinical Fellowship. Something about being paid for the work you are doing – it rights the soul. All those sleepless nights studying, worrying, writing, reading – ugh! If I had been paid for the work I invested in my education, let’s just say you could all come stay with me on my own Alaskan homestead. Where in the world I got those ideas, I have not a clue. But I had them. And so do many of my readers. It’s a common question that people ask in their emails to me – “Does starting in the school setting impact my career opportunities later?” The longer you work in any setting, the more familiar you become with the procedures as it relates to evaluation, treatment, referrals, paperwork, etc. But we all start with the same education. 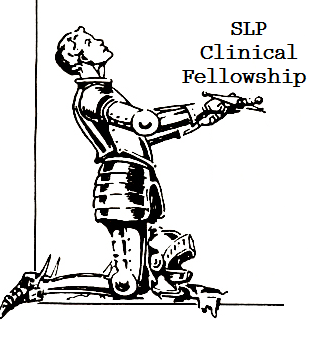 Another SLP who does their CF in a hospital will have more experience in that area than an SLP-CF who starts in a school. But who’s to say they can’t both switch fields later on down the road. It happens all the time – people just don’t speak of it. So I will speak of it. If you are wondering whether ’tis nobler to start in a school district or ’tis nobler to work in the medical setting, do what is in your best interest. Search for what you can find. Search for something that peaks your interest. If there are no medical positions like you want, then work in a school. You might like it. If you can’t find any school openings like you want and a great medical opportunity presents itself, take it. You might like it. Fight for the job of your dreams of course, but sometimes life might steer you towards a new dream. Alaska was my crazy dream. Lady SLP_Echo, Knight of Alaskan schools, at your service. I started out in a school, as you know – did schools for 8 years. I wouldn’t trade a day of it. I am happy to be in a hospital at the moment. Adulthood is long. Do it all.